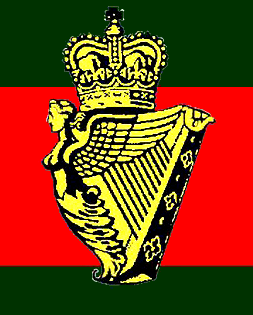 The 3rd (County Down) Battalion, Ulster Defense Regiment (3 UDR) – South Down Militia – was formed in 1970 as part of the 7 original battalions specified in The Ulster Defense Regiment Act 1969, which received Royal Assent on 18 December 1969 and was brought into force on 1 January 1970. It was, along with the rest of the regiment, amalgamated with the Royal Irish Rangers in 1992 to form the Royal Irish Regiment. South Down refers to the southern part of County Down in Northern Ireland. While this song originally belonged entirely to England and her Empire, today it is sung by Irishmen of all types and during the Anglo-Irish War was a great favorite with those who were fighting England and her Empire. And the place they show their bravery is on the battlefield. But them South Down Mileeshy is the terror of the land." For them South Down Mileeshy is the terror of the land." "Och, Major Wallace" says the Queen,them boys of yours look grand." "Och, hold your tongue" sayes Wolsely, "them's the terror of the land." The Kaiser says to Von der Glotz "The war is nearly done. For them South Down Mileeshy is the terror of the land!